I can’t believe its Autumn already. Although a glance out of the window convinces me it is; it’s currently pouring with rain, which means I’ll be lighting a cosy fire later tonight. Nothing I like more than cuddling up on the sofa with my husband in front of a roaring fire. Usually to watch re-runs of NSIC starring Mark Harmon, but that’s another story! 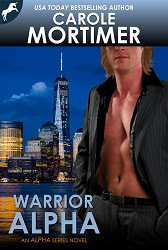 October 4th saw the publication of Warrior Alpha the 6th book in my bestselling ALPHA series. The hero of this sixth book is Nikolai Volkov. He has appeared in two of the previous books in the Alpha series, so fans of the series will already know him. Nikolai left Russia twenty years ago, barely surviving on the street of London for several months he then falls foul of the Russian overlord of London’s criminal underworld, Dimitri Markovic. Instead of punishing him, as Nikolai expected, Markovic takes the young man into his own family. Twenty years later Nikolai is head of security for the powerful Markovic family, and totally loyal to Dimitri’s son Gregori, the new head of this powerful Russian family. Tough, hardened, more than capable of taking care of himself, Nikolai’s isn’t in the least impressed when Gregori hires Daisy Redmond to protect him from the assassins sent kill him. The attraction between these two opposite is instant and blazing hot, as they battle side by side in order to keep Nikolai alive. The 7th book in the series, Rogue Alpha, to be released December 4th, is now available for pre-order. My cover design lady and I have now chosen and designed the first two covers of my new Regency romantic suspense series, Regency Unlaced. Hey, it isn’t easy drooling over all those Regency heroes and then having to decide which one is right for which story. The pre-order for the first story in the series, TheDuke’s Mistress, is now available, with a release date of November 4th. The covers of this series are spectacular—thank you, Jo. I am so excited about the launch of this new Regency romantic suspense series. It’s to be published alternate months with my Alpha series during 2016. Indie publishing has given me the opportunity to spread my wings, to write more suspenseful stories, and steamier heroes and heroines, than my previous books. Not only that but I get to design the covers, choose my editor and proof-reader, plus the publication date. I go around the house saying ‘I have the POWER’ in my best superhero voice, at which time one of my sons usually pipes up with ‘what about dinner?’. No sense of occasion, that the problem with these young men! Amazon Kobo, ibooks and Smashwords.